For those who want something a little different for their new F-150, Roush Performance introduces a new package for the 2004 F-150: the Roush Tejon. The Tejon package adds a little visual impact from all angles. The front gets an aggressive touch with the addition of a body-colored hood scoop. From the side, you can see the 20" chrome wheels & tires...as well as the Roush Tejon graphics. 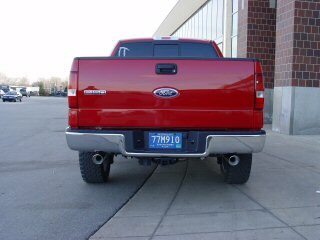 From the rear, you can see the dual exhaust systems outlet, with polished Roush Performance tips. The Tejon is currently under production at the Roush Performance facility in Livonia, MI. 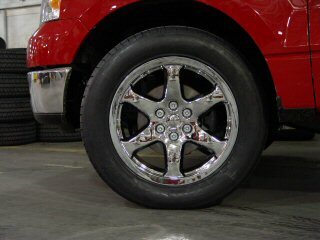 Also available are Stage 1 and Stage 2 packages, with a Stage 3 F-150 under development. 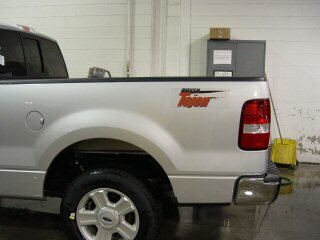 These trucks, and other Roush vehicles, can be ordered from the Roush dealer network throughout the US and Canada.